The Thermo Scientific GPR Series Undercounter Refrigerator is compact ideal for keeping frequently used samples at hand. This undercounter lab refrigerator features excellent temperature uniformity and stability, <3°C, making sure there are no spots that could hit zero degrees. The whisper quiet operation of this lab refrigerator also means having it nearby your station won’t be a distraction while you work. 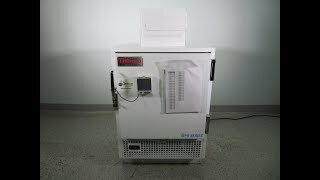 This 5.4 cu ft undercounter lab fridge has a temperature range of between 2 and 10°C with a preset of 4°C, and can be adjusted through he microprocessor controlled digital display. The interior of the Thermo GPR is stainless steel for durability and easy clean up with a 1 inch access port to accommodate instrumentation. Digital Data Logger seen on door is not included. This is our inhouse test equipment. This Thermo Scientific GPR Series Undercounter Refrigerator has been fully inspected and comes with current validation reports. All of our lab equipment comes backed with our standard warranty. Should you have any questions, please don't hesitate to contact us.